Here's an "attaboy!" for a young man making his way in his profession. 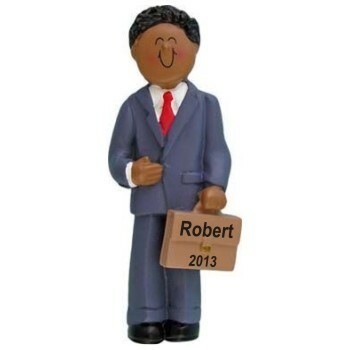 The African American male businessman personalized Christmas ornament is dressed for success and carrying a briefcase that we'll personalize with the information you provide. Additional African American ornaments we carry relate to school, careers, music or family events like weddings, anniversaries and births. Tell someone how proud you are of them with the male businessman African American personalized ornament that arrives in our exclusive velvet gift pouch.